Being a YouTube creator may seem like all fun and games, but it takes hard work to be successful. And success means being able to keep your audience engaged through fun and interesting videos. That’s where it gets challenging. You may be surprised at how quickly you can run out of content ideas for your channel. 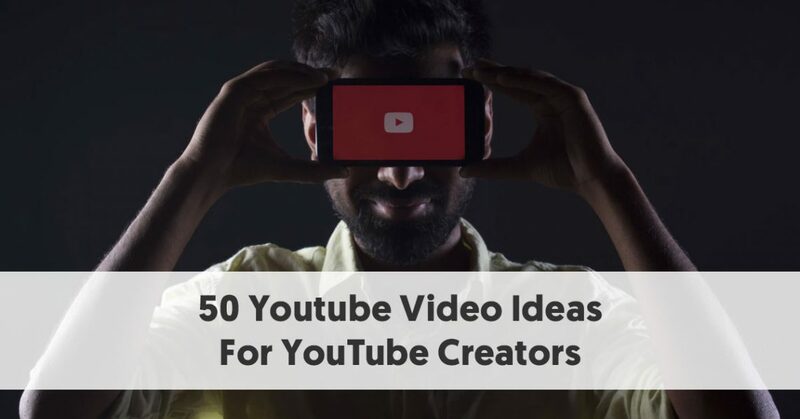 If that ever happens, or if you’re just starting to build your channel, these 50 video ideas can help inspire you. #16: What’s on My Phone? #17: What’s in My Bag? If you haven’t already done one, an introductory video is a must. This is where you tell your audience a little bit about who you are and what kind of videos you’re going to create. Opinion videos are a great way to ride the wave of a trending topic and get some exposure. If there’s a hot debate related to your niche, weigh in on it through a video. Review a new or trending product related to your niche to entertain and inform your audience. Make sure you keep your review honest and interesting if you want it to have any value. You could even create a recurring series of review videos. Look for opportunities to interview other content creators or influential figures in your industry. This will provide fresh content to your existing audience and draw in the interviewee’s audience to your channel. You could also create a video to respond to another YouTuber’s opinion video. Do you disagree with their opinion or do you have something to add? Share your thoughts in a video. 51% of American YouTube users are on the platform to figure out how to do certain things, according to the Pew Research Center. If you’re an expert at something, you could create tutorial videos that will help your viewers. Perhaps you can teach them to create a certain look with makeup, craft something, use a new design tool, or even use a particular product. Tutorials give you an excellent opportunity to create recurring videos for your channel. Invite your viewers to ask you a question in the comment section or on social media, and compile those questions for a Q&A video. The session could be on a specific topic or an AMA (Ask Me Anything) compilation. Book reviews also make for excellent video content if you know how to keep things exciting and fun. Choose a book that you love, hate, or have recently read and tell your audience what you think about it. Movie reviews can also help you attract an audience. Make sure you choose a trending movie and keep the review interesting with relevant jokes and expressions. Is there a trending video that everyone seems to be talking about? When you watch it for the first time, film your reaction to create a reaction video. Parody videos can be a huge hit if humour is part of your channel identity. Parody a famous movie, show, YouTube video, or music video to entertain your audience. Giveaways are perfect for attracting new viewers and engaging your existing ones. Make sure you offer a reward that your audience will find valuable. Every now and then, a new challenge comes up and takes over the internet by storm. Improve the visibility of your channel by participating in a trending challenge. Take your viewers on a tour around your room or studio so they can learn a bit more about you and how you work. Show them where you turn your ideas into reality. Do you collect baseball cards, comic books, coins, or perhaps vinyl records? If you have a decent collection of items, you could create a video showing it off to your viewers. Create a video showing your viewers what apps you have on your phone and which ones you use most frequently. Give your viewers a chance to learn more about you by showcasing what you carry around in your bag. Create a video to show your audience what a typical day in your life looks like. This is an interesting way for them to get to know you better while getting a behind-the-scenes look at how much work goes into the videos they watch. 28% of American YouTube users are on the platform just to pass the time. So give them some fun and humorous content to engage them. Comedy shorts would be an excellent way to entertain your audience. Lists tend to perform really well, regardless of whether it’s written or visual content because the information is much easier to process. Create list videos in which you list some of your top tips or favourite things in a relevant niche. If there’s a new trending product in the market, create a first impressions video where your viewers get to see your authentic reaction. Give them your honest insights and opinions so they can make an informed buying decision. If you have a career besides being a YouTube creator, do a video in which you discuss it in detail. Got any interesting hobbies that your viewers might be interested in? Discuss them in a video. Unlike the one-time trending challenge mentioned earlier, a 30-day challenge is where you attempt to do something for 30 days. It could be anything from drawing something every day for 30 days to trying to lose weight within 30 days. You’ll also have an opportunity to create recurring content for the duration of the challenge. For YouTubers who have been around for a while and created quite a bit of content, throwback videos can be a great way to entertain your audience. Compile clips from your old videos into one throwback video with some fun commentary. In almost every niche, there are very inaccurate and absurd myths that people believe such as “sugar makes kids hyper” or “microwaves cause cancer.” Create a video to bust common myths related to your niche. It can be fun to explore the history of topics you’re interested in. Do a video discussing the history of a product, brand, or any other topic that’s relevant to your niche. Keep your content current by picking out the latest news pertinent to your niche and discussing it in a video. Comparison videos can be a great way to create review content without focusing on just one product. Make your reviews more useful for your audience by comparing two very similar products and giving them your recommendation. Once you’ve built some influence, brands may give you exclusive early access to the products they’re going to launch. Create an exciting preview video telling your viewers what you think about it. If you know a trick or hacks that you think your viewers will find useful, create a video showing them how to do it. Know some interesting facts about how something works like how chicken nuggets are made or what your brain’s like on alcohol? Turn the information into an animated explainer video. Sometimes, content with shock value is exactly what you need to attract an audience. Do something outrageous (but not dangerous) like breaking apart your phone to see what’s inside or shaving your head. Did something happen during your recent shopping trip to a big retail store? Or did you attend a disappointing event? Document your experiences in a video on your channel. If you’re a gaming YouTuber or if you often create gaming content, create in-game skits. Record your gameplay and then edit it with funny commentary to entertain your viewers. Are there rumours about new updates, releases, or product launches in your niche? Create a video discussing them and speculating what you think. Came across an old ad, movie, or show? Take some clips and dub them with funny commentary or turn them into comedy skits. Got any favourite haunts that you want to share with your viewers? Or perhaps you have some interesting historical facts to share. Take your viewers on a tour of your favourite places in the city. Did you manage to pay off your student loans in just a few years? Or perhaps you achieved your fitness goals through a few lifestyle changes. Whatever personal achievements and experiences you’ve had could make for interesting and valuable videos to help your viewers. Got a favourite ingredient that you just can’t stop talking about? Or perhaps you’re living a lifestyle that you want to share with your viewers? Create a video highlighting the benefits so you can get your message across. People like to watch videos that they can relate to. Create skits that portray situations that are relatable to your viewers with a comedic twist. This could be anything from dealing with difficult clients to dealing with pets. Know an unusual way to tackle a common challenge? Whether it’s how to get rid of tough stains or how to get over time management issues, share your ideas and solutions with your viewers. Besides participating in a trending challenge and doing a 30-day challenge, you could also get your viewers involved by letting them challenge you to do something daring. Ask them to leave a comment or mention you on Twitter, and go through all of their challenges to see which ones would be most viable. Whether it’s eating durian or trying Surströmming, challenge yourself to try unusual foods that you’ve never had before. Your first-time reaction to trying foods that have infamously pungent smells or unusual textures might be a great source of entertainment for your audience. Test the feasibility of tips and instructions provided by other YouTubers to give your viewers a realistic take on popular how-to videos. Create a video in which you attempt to follow their instructions and talk about what works and what doesn’t. Create a compilation of fails relevant to your niche – whether it’s video games, design, or fitness. Unboxing videos are extremely popular with content creators on YouTube. You could create your own and record yourself unboxing a new product that you bought or received from a brand. Co-creating content with other YouTubers can be a great way to attract an even bigger audience. Invite another YouTuber relevant to your niche or someone you’ve become close friends with as a guest on your channel. But instead of interviewing them like discussed earlier, do something together like exploring the city, singing a song, cooking, trying new things, etc. Live-streaming is a great way to take your viewers along for the ride in real time, which can help you build rapport. You could do a live stream of your experiences and answer your viewers’ questions on the spot. Finally, come up with video ideas based on what your fans want. Ask your viewers what kind of videos they’d like to see from you. Collect those suggestions and come up with new content ideas that will appeal to your audience. These 50 video ideas are mostly suitable for all sorts of niches. You can take the general concepts and see how they could fit into your niche. For example, a gaming YouTuber could do a 30-day challenge in which they use a gaming console they really dislike. Or a foodie YouTuber could challenge themselves to avoid junk food for 30 days. It’s all about how creative you can get with these basic ideas and concepts.